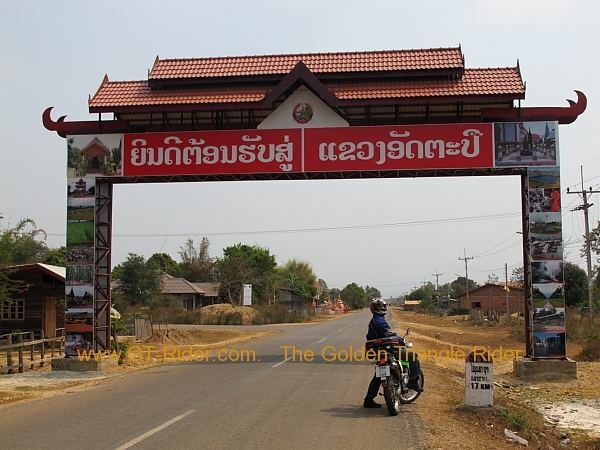 Attapeu is a province of Laos, located in the south-east of the country. To the north it is bounded by Sekong, to the west by Champassak province. To the east, the Annamite Mountain Range separates Attapeu from Vietnam. It borders Cambodia to the south. It has five districts (Samakkixay, Xaysetha, Sanamxay, Sanxay and Phouvong) covering an area of 1,032 square kilometres (398 sq mi) with a population of 139,628 as of 2015. Its capital city lies at Attapeu (Muang Samakkixay). It was known as the "land of the Heroism". There are two biodiversity areas: Dong Ampham Forest (200,000 ha) and Xepaine Forest. A large part of the province is under the Dong Ampham National Biodiversity Conservation Area. The province was part of the Lane Xang Kingdom during the reign of King Saysethathirath. Earlier to this it was a habitat of wild buffaloes known as “Idkabue” (meaning: "buffalo dropping"), which the French colonial regime became "Attapeu". During the revolutionary war against the French regime the province was the headquarters of the National Libertaion Front. By the end of the war, much of the area was destroyed, remnants of which could be seen even now in some stretches of the Ho Chi Minh Road. The province's terrain is characterized as rugged and wild with scenic beauty. Its capital city Attapeu (Samax Sai) is in a very scenic valley. The Bolaven Plateau stretches across Attapeu as well as three others provinces, Champasak, Salavan, and Sekong. The landscape of the province consists of thick forest, rivers and streams and plains areas in the backdrop of mountains such as Phou Saphong and Phou Luang. The principal rivers are the Xe Kong, Xe Kaman, and the Xe Xou River and the province is difficult to approach during the rainy season. The province also has several waterfalls of note. These include the 23 m high, 120 m wide Tad Saephe Waterfall in Xepaine Forest, the 10 m high, 30 m wide Tad Samongphak Waterfall between Houay Samong and Xepaine River, Tad Phok Waterfall, and Tad Phaphong Waterfall, running from Xe Xou River. During the American War in Vietnam, parts of the Ho Chi Minh Trail passed through the province. The main roads are Route 13, the most important road in the country, and Route 11. The main settlements are Attapeu, Xaysetha, and Sanamxai. Dong Ampham National Biodiversity Conservation Area (NBCA) is the protected area which lies within the Attapeu Province (on the northeastern part) and Sekong Province (on the southeastern part). 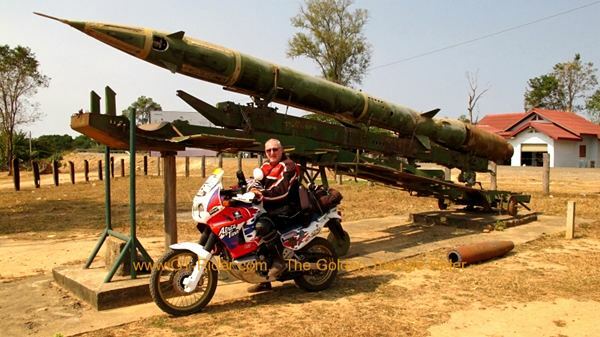 It is situated in the southeast corner of Laos on the border with Vietnam. The NBCA is heavily forested and covers about 200,000 hectares. Established in 1993, it is one of the 23 National Biodiversity Conservation Areas of Laos. Dong Ampham is home to "some of the last intact areas of lowland and tropical forests remaining in mainland Southeast Asia." Topographical features include Xe Kaman and Xe Xou Rivers, and the volcanic lake Nong Fa Lake. Tigers and Clouded leopard are recorded fauna in remote areas. The 71,400 hectare Attapu Plain is an Important Bird Area (IBA) adjacent to the NBCA. It is situated at an altitude of 200–400 metres (660–1,310 ft) above sea level. The topography includes wetlands, such as the Xe Khaman and the Xe Xou rivers, as well as freshwater lakes and pools. Dry forest landscapes, dry deciduous forest, shingle and stony beaches are habitats. Notable avifauna are the Lesser Fish Eagle Ichthyophaga humilis, Red-headed Vulture Sarcogyps calvus, and White-rumped Vulture Gyps bengalensis. 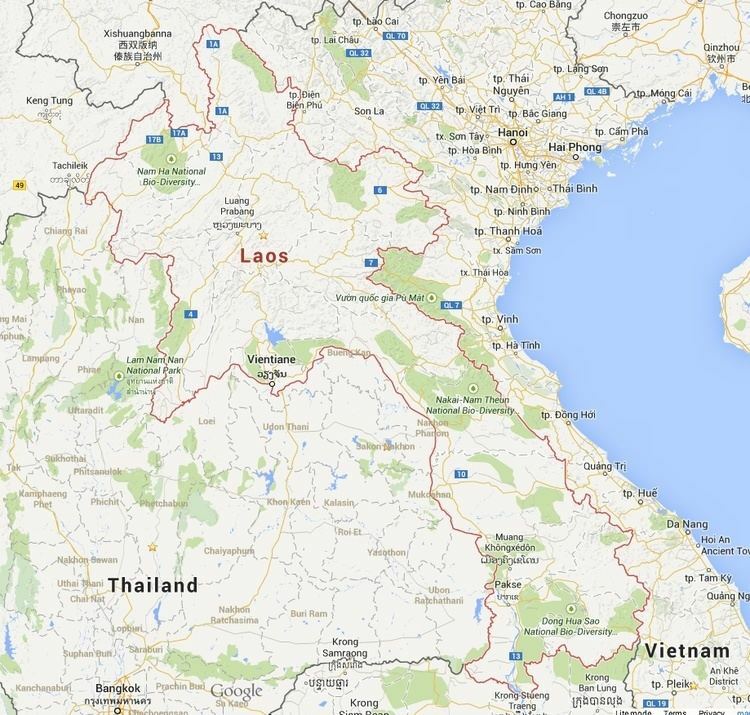 Lao Loum people in Attapeu outnumber those in other close-by provinces. Its population is reported to be 110,000 and consists of several ethnic communities; 15 major tribes are reported in the province which include Lao, Alak, Katang, Kaleum, Katou, Suay, Oy, Taoy, Sadang, Nge, Lavea, Lavenh, Cheuang, Tariang and Nyaheung groups. Attapeu's economy is largely agricultural. In this province, the trade in wild life is significant (though underestimated by the government) and hence its conservation is important. The listed globally threatened wild life species are 14 (as per the World Conservation Union (IUCN Red List and 23 specuies according to the CITES. In the rural economy of the predominantly rural structure of Laos (80% of rural households), the dependency on forest produce is very large, concentrated in the fields of wild animals and plants, exchanged and extracted for achieving sustainable income; fish is one of main aquatic vertebrae exploited, apart from other terrestrial and aquatic vertebrae. Given its proximity to Vietnam the province has traditionally been a source for raw materials and forest products for adjacent regions in Vietnam. Luxury forest products exported by Champa through its seaports were sourced from places as far as Attapeu. 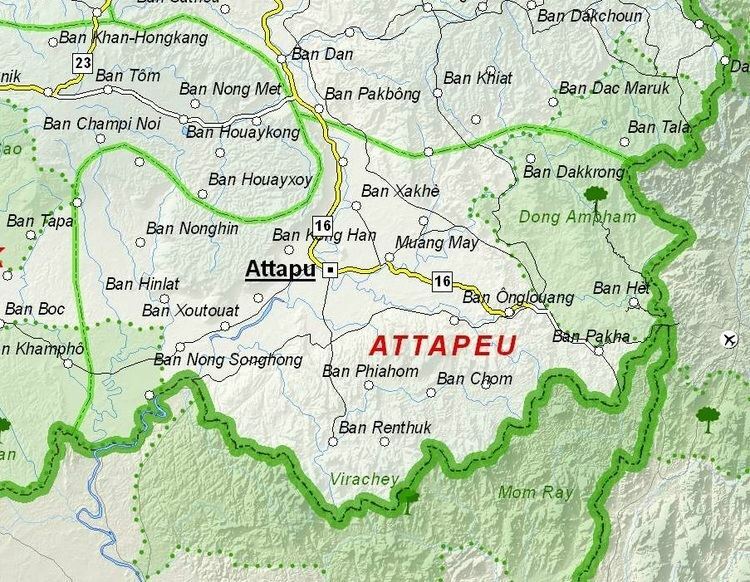 More recently, some Vietnamese companies expanded into Attapeu province. Hoang Anh Gia Lai Group has acquired rights to grow rubber trees in the province. The company also plans to invest in electricity generation, sugar refining, and organic fertilizer production. Construction of a US$100 million sugar project including industrial facilities started in November 2011. Some of the important locations in the province are the Wat Sakae Temple which has a sacred Buddha image and is visited during the Lao’s New year, and an old Pagoda and Xaysetha Stupa in Xaysetha District, built in 1579. The temple of Wat Luang Muang Mai in the capital city of Attapeu was built in 1939 and is notable for original naga bargeboards. King Setthathirat of the Lan Xang is buried in a stupa at the temple of Wat Pha Saysettha in Pha Meuang, approximately 15 kilometres (9.3 mi) from the capital city. The Sihanouk Trail branches from the Ho Chi Minh Trail at Phu Vong, 13 kilometres (8.1 mi) from the capital.